NASA astronaut Scott Kelly was the first to spend an entire year in space! Discover his awe-inspiring journey in this fascinating picture book memoir (the perfect companion to his adult book Endurance) that takes readers from Scott’s childhood as an average student to his record-breaking year among the stars. Scott Kelly wasn’t sure what he wanted to be when he grew up. He struggled in school and often got in trouble with his twin brother, Mark. Then one day Scott discovered a book about test pilots and astronauts that set him on a new path. His new focus led him to fly higher and higher, becoming first a pilot and then an astronaut, along with his brother—the first twin astronauts in history. But his greatest accomplishment of all was commanding the International Space Station and spending nearly a year in space, which set the record for the longest spaceflight by an American. This story of an ordinary boy who grew up to do extraordinary things is perfect for children, fans of Scott's adult book Endurance: A Year in Space, A Lifetime of Discovery, aspiring astronauts, and anyone who has ever tried to defy the odds. It will amaze and inspire you. Scott Kelly is a NASA astronaut best known for spending a record-breaking year in space. He is a former U.S. Navy fighter pilot, test pilot, and veteran of four spaceflights. Kelly commanded the space shuttle Endeavour in 2007 and twice commanded the International Space Station. He resides in Houston, Texas. You can follow him on Facebook at NASA Astronaut Scott Kelly, and on Instagram and Twitter at @StationCDRKelly. André Ceolin is a self-taught illustrator based in Brazil. He has illustrated more than twenty books for children. 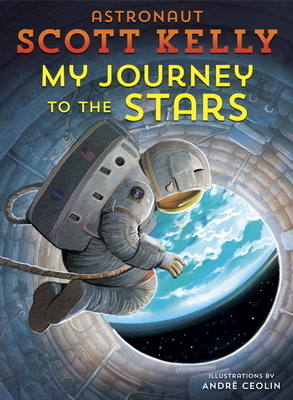 My Journey to the Stars is his third children’s book in the United States. For more information on André and his work, visit him at andreceolin.com.